Timex 80 classic Retro Digital Watch with Pink lens. A real sense of 1980s Vintage nostalgia, but in truth this is a timeless accessory. A simple and stylish Silvertone bracelet watch with fantastic Retro colour pop lens. Set the alarm, start the stop watch and use the Indiglo® Night-Light to light your way! - The Timex 80 Retro Digital Watch is a must have accessory and a great gift idea. Presented in a stylish hard case box, this classic Timex 80 Retro Digital Watch features silvertone stainless steel strap with traditional clasp fastening. Approximately 35mm width by 12mm depth silver casing and a striking Vintage 1980s inspired hot pink lens. Water resistant up to 30 metres, Indiglo® Nightlight technology, acrylic lens. Digital time display, date function and stop watch feature. A stand out Retro accessory, the Timex 80 Watch is practical and undeniably stylish. 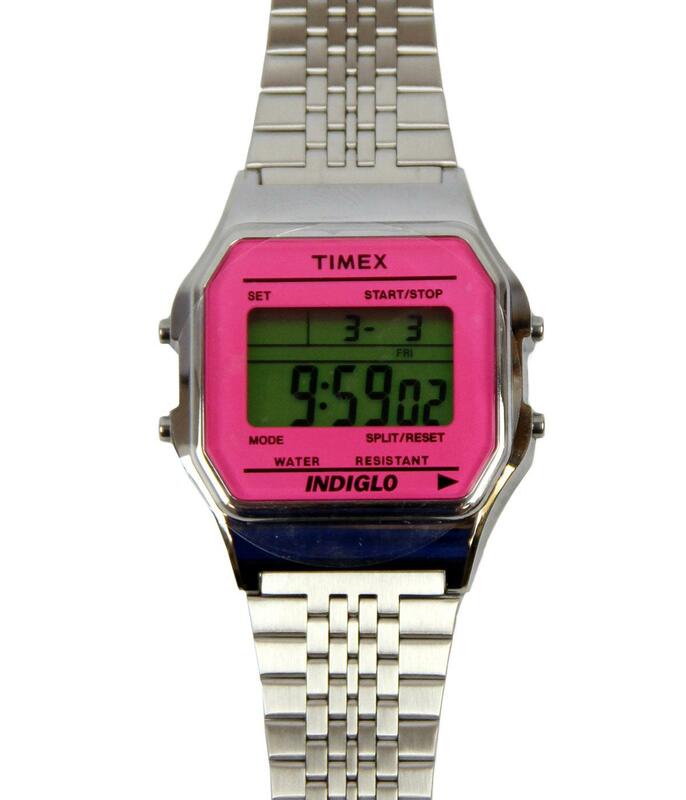 Key Points: Timex 80 digital wash with silvertone bracelet and pink lens. Stop watch, date function and Indiglo® Night-Light feature. SKU: TW2P65000U8 Timex 80 Digital Watch. One size. Approximately 35mm case width and 12 cm case depth.